Harry Beautyman celebrates his goal against Coventry. Photo: Joe Dent/theposh.com. Harry Beautyman’s first goal of the season against Coventry on Good Friday means 17 different players have scored League One goals for Peterborough United this season. That’s a tally bettered only Wigan (21) and Southend (18). Conor Washington remains Posh's top scorer despite leaving the club in January. Photo: Joe Dent/theposh.com. The rest of the Posh goals have been scored by: 8 Lee Angol, Marcus Maddison, 6 Souleymane Coulibaly, Erhun Oztumer, Jon Taylor, 4 Jermaine Anderson, Michael Bostwick, 3 Gaby Zakuani, 2 Chris Forrester, Aaron Williams, 1 Miles Addison, Harry Beautyman, Callum Elder, Tom Nichols, Martin Samuelsen, Ricardo Santos. Back-to-back wins have moved Posh up to 14th in the League One table. They are 13 points from the play-off places and 10 points clear of the relegation zone. If Posh do manage to pull off an unlikely eight wins from their final eight matches they would reach 75 points, which on average over the last 10 years, has just been enough to sneak into the top six. The remaining Posh fixtures are not particularly daunting apart from a Tuesday night trip to Barnsley. 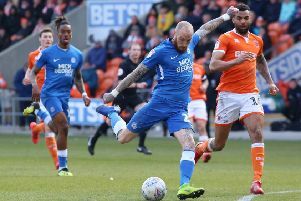 Posh host bottom club Crewe on Saturday (April 2) and then it’s Fleetwood (away, April 5), Rochdale (home, April 9), Colchester (away, April 16), Barnsley (away, April 19), Scunthorpe (home, April 23), Shrewsbury (away, April 30) and Blackpool (home, May 8). Posh are more likely to influence the race to avoid relegation for the rest of this season.